Belly button rings can get stuck in the piercing due to swelling, puss or infection. 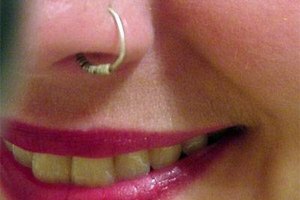 If the piercing is new, you should not remove it or play around with it, as it needs time to heal. 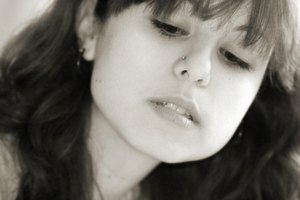 If you have had the belly button for more than two months, you can remove the ring from the piercing if it is infected. To remove a belly button ring from a swollen or infected piercing that appears stuck, follow these simple and careful steps to avoid pain. Submerge your belly button in water, so the skin becomes wet and soft. You can either do this in a bathtub or perform the following steps after taking a shower. Apply some hydrocortisone cream to the tip of your fingers. Dab some cream around the piercing hole and along the shaft of the belly button ring. Slide the belly button ring slowly through the piercing, creating some movement. Continue this movement back and forth until it slides well. If the ring is stuck due to swelling, be careful when you create movement as it can be painful. Adjust the belly button ring so the end that opens faces outward. If you have a bar, slide the opposite end of the bar inside your navel, so the opening end is out. Wash and dry your hands. Twist the ball or unhook the ring that secures the ring in the piercing. If it is also stuck, use a small pair of pliers to unscrew. Slowly pull out the belly button ring from the piercing. 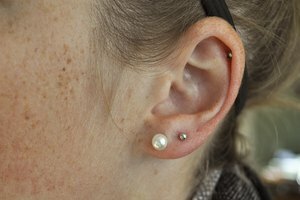 If your piercing is infected, consider getting some anti-inflammatory ointment from a piercing shop, so the swelling can go down while the infection is healed. Do not insert another belly button ring before the infection is gone.